A Wild View Yonder is an incredible log cabin in beautiful Dogwood Farms Resort. 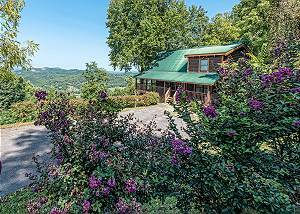 You will have amazing Wears Valley Views with the seclusion... VIEW NOW. Acorn Cabin Rentals is the recognized leader in prestigious luxury cabin rentals in Gatlinburg, Pigeon Forge, & The Smoky Mountains. Whether you are looking for a cabin with a spectacular mountain view or a premier cabin on the Little Pigeon River, Aunt Bug's offers premium cabins to suit your family's needs and your vacation budget. Our cabins offer the finest of furnishings conveniently located near Dollywood, Gatlinburg, Pigeon Forge, Ripley’s Aquarium, shopping, fishing, white water rafting, golf, and the great hiking and waterfalls of the Great Smoky Mountains National Park. These great cabins are perfect for a romantic getaway, honeymoon, family vacation, reunions, or a corporate retreat! We offer a full range of Property Management & Rental Services. Please call us at 1-866-286-8284 to speak to a Property Manager or Click Here for prospective owner information.